Bacon makes every dish better, and sandwiches are no exception. See unique ways to incorporate everyone's favorite breakfast staple into the classic grilled cheese sandwich. 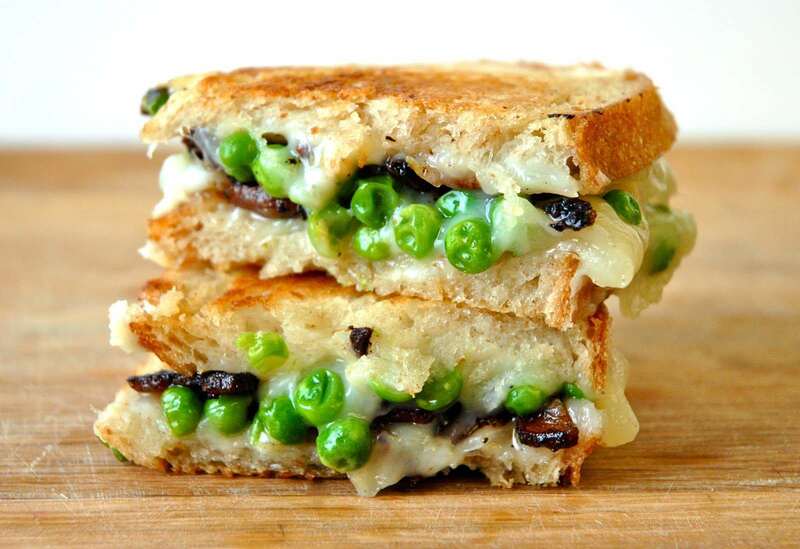 One of our favorite dishes to make in the winter is goat tomme grilled cheese with sweet peas and bacon. Add a little bit of goat cheese and it gets even better in our opinion. It's rich, creamy, meaty, and fresh and it makes a super delicious grilled cheese sandwich. There are just a few things you need to know about this tomato jam, bacon, pickled jalapeños + potato chip grilled cheese sandwich. One. it has bacon. Two, it has tomato jam. And three. IT HAS POTATO CHIPS in it. And of course four. Once you eat it, you might cry. Sauteed butternut squash, crispy bacon, and melted gouda come together between two buttery toasted slices of lard bread to create a sweet and savory sandwich that highlights the beautiful flavors of fall. The bread in this butternut squash grilled cheese with gouda + bacon sandwich calls for is made with lard, so the fat content is much higher than regular store-bought bread. Wisconsin Cheddar, sweet and savory tomato jam, crispy bacon, and a runny egg yolk grilled between two buttery slices of brioche bread come together to make this insane hole-in-one grilled cheese. And let's face it, after making this recipe, your mornings will never be the same. Make your next camping trip even more special by grilling up some tasty grilled cheese sandwiches! All you need are sandwich ingredients, a cast iron pan (or a waffle iron), and a fire. It's even better if you have some sort of mesh lid, like a grease splatter screen or a large sifter, so that it will help keep the ash off of your food. As for fillings, you can totally get creative here, but we always recommend using leftovers or bacon because then you can use the bacon grease, rather than the butter, to cook the sandwich in. You can even pre-make these camping grilled cheese sandwiches at home, wrap them in tinfoil, and throw them in a bag so that they're ready to cook whenever you get hungry.